Around 300 km from Brisbane on the Bruce Highway is the National Trust town of Childers. The township is set on top of rolling hills of red soil framed by green fields of sugar cane. In 1902 a disastrous fire destroyed much of Childers but the subsequent rebuilding has given us the amazing variety of architectural styles still largely intact today. Take a stroll through the cool Leopard tree lined streets. The best place to start is at Gaydon's building (1894) in Churchill Street which is now the home of Childers Pharmaceutical Museum, Art Gallery and Tourist Information Centre. The much awarded museum is believed to be the only one of its kind in Australia and now dispenses tourist information rather then patent cures. 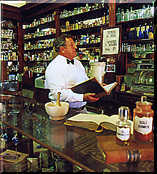 The old Chemist Shop still contains the original red cedar fixtures and fittings, National Cash Register (1906), ground glass bottles with gold leaf lettering, leather bound prescription books and wedgewood mortar and pestles. Upstairs in the same building is the Childers Art Gallery, formerly a dentists surgery. Light from the magnificent skylights shines on regular changing exhibitions by some of Queensland and Australia's finest artists. To the north, the original Grand Hotel was moved on from Horton to its current site in the 1880's. On the opposite corner is the Federal Hotel (1907) with its much photographed swinging doors and iron lace. In North Street the Royal Hotel is older still, built in 1894 using timber cut to make way for the railway. The Butcher Shop (1896) was first tiled outside Brisbane and escaped the fire of 1902. Back in Churchill Street to the south the Court House was built in 1896 and enlarged in 1900 and the Post Office (1887) has been maintained in its original form. 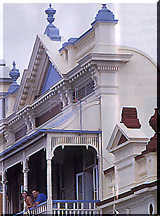 The National Bank (1895) was built as a branch of the bank of North Queensland and the two storey R.S.L. club was built in 1901 for the C.B.C. Bank. Further up the street is the Soldiers Room Memorial in the Isis Shire Chambers opened in 1926. Across the road is Taylor Street where the Historical Complex is situated. The cottage (c. 1890) and school were removed from Isis Central Sugar Mill and contained a treasure trove of memorabilia. There is also a comprehensive collection of local aboriginal artifacts. The Flower locomotive was imported from England in 1916. Pause and take time to reflect on the town's wonderful heritage. Childers is also an access point to the Burnett hinterland.